What Can Be Done for Loose Teeth? Loose teeth are normal in children as they lose their baby teeth and get their permanent set. Some adults develop loose teeth too, but the American Dental Association, ADA, warns this is usually a sign of periodontal disease. The teeth can actually fall out if you don't treat the problem. Fortunately it is reversible if you catch it early and follow a treatment program. Periodontal disease is caused by infected gum tissues. The infection gets into an area between the teeth and gums, called the sulcus, the ADA explains. It breaks down supporting tissues and creates a pocket that gets deeper as the disease progresses. This damages the attachment of the teeth to the gums and they become loose. The Colgate toothpaste company warns that 80 percent of adults in the United States have some degree of gum disease. Periodontal disease starts out as a milder condition called gingivitis that doesn't loosen the teeth, according to the ADA. There may not be any symptoms until the problem has progressed. Eventually you will notice gum inflammation and bleeding and bad breath. Your gums will pull away from your teeth, and eventually they will separate and loosen. 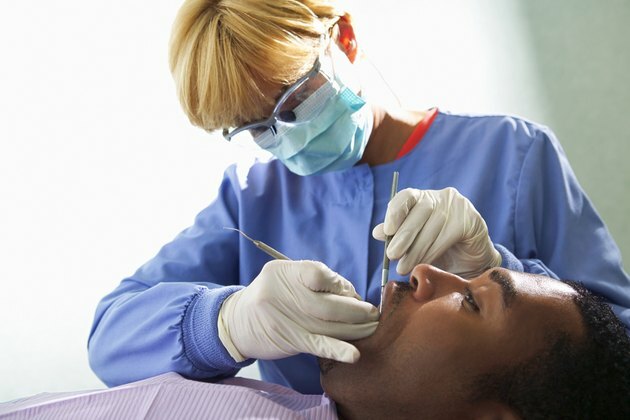 They will fall out or have to be pulled by a dentist if you don't get professional treatment. Several risk factors make you more prone to periodontal disease and loose teeth. The ADA cites smoking, defective fillings, poorly fitted bridges and crooked teeth as common risk factors. Diabetes and use of certain medication, including calcium channel blockers, birth control pills, anti-epilepsy drugs and steroids, also contribute to the problem. Colgate explains you may be able to stop periodontal disease and save your loose teeth with deep cleanings. Your dentist will do a procedure called scaling that gets rid of plaque above and below your gum line. Then she will perform root planing, which destroys rough areas where bacteria thrives on the tooth roots. You may also have to use special mouthwash or medication. Surgery is necessary if the other measures do not work. You may need bone and tissue grafts to stabilize your teeth or flap surgery that gets deeply embedded tartar out of your gum pocket flaps. Severe cases may require your teeth to be removed. Your dentist can replace them with bridges, dentures or implants. Your teeth will stay firmly rooted in your mouth if you actively prevent periodontal disease. The ADA recommends brushing your teeth with a soft-bristled toothbrush twice a day to get rid of tooth-loosening bacteria. Floss your teeth daily and use a fluoride rinse to strengthen them. See your dentist every six months for a professional cleaning, and make an appointment immediately if you notice a loose tooth or other signs of potential dental issues. What Are the Treatment Options for Loose Teeth Due to Gum Disease?